The Cascade Company wants to jolly up your life. Whether your holiday event is a splashy company party, a boisterous evening with friends or an extended-family brunch, The Cascade Room, El Camino’s, Charlie’s Little Italian and The Union promise enough hospitality heat to melt your proverbial marshmallows with irresistible group menus, outstanding drinks and a warm, festive atmosphere. If you’re on a budget, Cascade Company is glad to plan with you to meet it. Even if you aren’t planning ahead for something big, consider dropping by one of the restaurants for stellar weekly food and drink specials that help make the season bright. A modern take on the classic UK pub, The Cascade Room comfortably accommodates groups of 20 to 90 people with group menus that range from canapés to multi-course family-style dinners. Your crowd can explore the cocktail list along with such appetizers as beef tenderloin carpaccio crostini, local oysters on the half shell and almond-crusted Spanish lamb meatballs, or sit down to a few well-priced bottles of wine and Moroccan spiced fritters, roasted strip loin and seasonal crème brûlée. 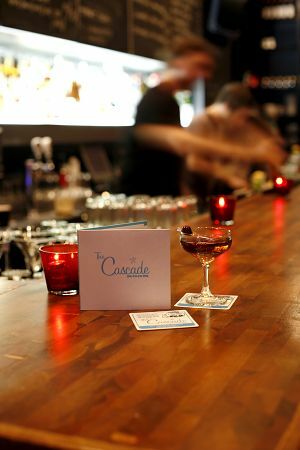 Everyone’s invited to Cascade Room’s Tree-Trimming Party on Tuesday, Dec. 1st. Your $45 ticket, purchased in advance due to limited seating, provides access to assorted canapés, two different kinds of bottomless punch-bowls and the fun of decorating numerous trees. Gather a few co-workers or friends for this event, which promises prizes for the “best holiday cheer” (open to interpretation). Book your spot at xmastreetrimming.eventbrite.ca. Sunday Roast: Every Sunday night – a feature roast with all the trimmings. Open daily at 5 pm. For more information, visit thecascade.ca/. Email info@thecascade.ca for group menus or to plan your next event. Lively parties of 15 to 65 will instantly embrace this hip neighbourhood pasta joint. Its friendly, family-style group menus include antipasto, bruschetta, orecchiette meatballs and margherita pizza. Not only are night-time gatherings a blast here, Charlie’s offers weekend brunches, perfect for meeting friends or arranging multi-generational get-togethers. Open daily at 5 pm. Weekend Brunch starting at 10 am. For more information, visit charlieslittleitalian.com/. Email info@charlieslittleitalian.com for group menus or to plan your next event. 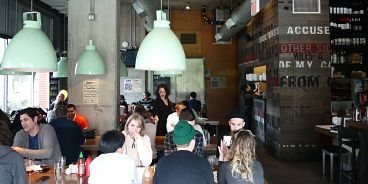 Groups of 20 to 50 will thrill to the sizzle of Latin American street food, with group menus served as appetizers or as family-style meals in El Camino’s lively, cheerful space. Margaritas make every party a night to remember, especially when they’re accompanied by tacos, chorizo arepas, and bocadillos. If you don’t know what those are, ay caramba! Pop by on your own ahead of time and find out. El Camino’s vibrant weekend brunch is another excuse to get together with your hungry posse. For more information, visit elcaminos.ca/. Email info@elcaminos.ca for group menus or to plan your next event. If you can’t physically escape Rain City this holiday season, how about a festive splash of Southeast Asia in party form? Immerse your group of between 20 and 80 people in firecracker flavours with one of two different family-style group menus that include Hawker Thai chicken wings, Indonesian peanut noodles, lemongrass pork sausage, and chai chocolate pots de crème. These flavours are so addictive that you may want to come back for weekend brunch. For more information, visit theunionvancouver.ca/. Email info@theunionvancouver.ca for group menus or to plan your next event.